You bring a few personal items. Or ride with us in the bus. Transportation: Paddle People can transport up to 12 people comfortably in our bus. Our bus has large windows which make for fantastic views. 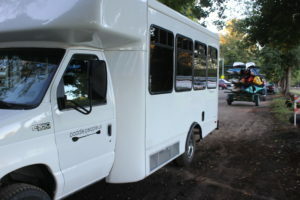 The comfy, air-conditioned Paddle People bus and 12 boat trailer can transport you, your boats, bikes and camping gear too. Guide Services: Russ Woodward, co-owner and “Canoeru” has paddled the waters of Oregon, Washington, California and Idaho for over 20 years. He has lived on the water, racing canoes, instructing, leading trips, and Russ has been a safety team member for Oregon’s largest annual paddle event, Paddle Oregon for many years. He has led hundreds of people safely down the rivers of Oregon time after time. Russ is also an active member, and former board member, of the Willamette River Keeper (WRK). WRK works to restore, protect, and preserve the Willamette River. Russ is a trusted river guide and a fantastic resource for planning a safe and fun adventure on Oregon’s Rivers and Lakes. 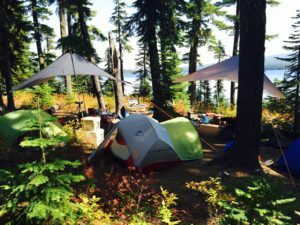 We are licensed, insured, and registered Oregon Guides.